The deck building industry has been revolutionized with the many new composite boards available! The first generation materials were made with a wood/plastic blend and were prone to staining and fading. 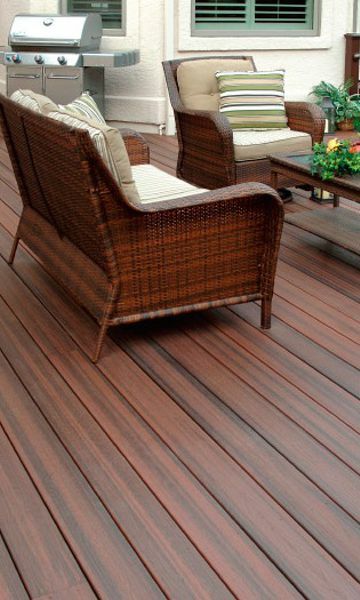 Todays composite decking is designed with a "capped" core and many offer stain & fade warranties. It is made to be ultra-low maintenance and can be kept beautiful with periodic cleaning. Each of the manufacturers have specific instructions for the care & cleaning of their particular products on their websites (see the links on our "Products" page). Most recommend annual or semi-annual cleaning with a pressure washer and soap and water. Here are a few general tips. Remove food, spills and other debris, then clean immediately to minimize the possibility of staining. This is especially important on a product that does not have the protective cap or stain warranty. Always test any cleaner on a small portion of your deck before cleaning the entire deck. Always follow manufacturer's application instructions when using any cleaner. Please note that any cleaner can lighten the color of your deck, particularly if it's an older, wood/plastic non-capped composite. Check the manufacturer-specific recommendations before using a rubber welcome mat, grill mat or outdoor rug. Never mix two or more cleaning agents when cleaning your deck. Always follow proper gapping (installation) instructions to prevent water and/or debris from accumulating on your deck. Never apply harsh solvents such as acetone, gasoline, benzene, carbon tetrachloride or paint thinner to your deck. Sanding the surface to remove stains is not recommended. Dragging furniture and other objects across the deck boards is likely to cause surface scratches. A pressure washer works great for removing dirt & debris, just check the manufacturer recommendation for settings. If you don't have a pressure washer, a garden hose and stiff-bristle broom should suffice. Natural wood is beautiful when it first goes down, but dirt, dust, tree pollen and air-born pollutants combined with the weathering effects of sun & moisture will make the deck turn gray within a few weeks. If you want to keep the warm yellow tones of a cedar deck or the red tones in your redwood, the best solution is to seal a new deck with a good, high solid-content sealer. Once installed, allow 6-8 weeks for the deck to air dry and lose it's mill glaze, then clean the deck before applying sealer. For cleaning, some folks recommend bleach & water, others advocate vinegar & water, sprayed on, scrubbed in and washed off. There are also several makers of "Deck Wash" products that can be used on wood and they are readily available in retail box stores or hardware stores. The best sealers include UV inhibitors or protectors and the higher the solid content, the better. We stock and sell the Messmer's line of wood deck cleaners and sealers. They were developed here in Colorado for our weather and intense UV. The cleaner is an easy-to-use, two-part system and their sealer contains more than double the solid content of other sealing products on the market. This is the "good stuff"! Timbers Diversified Wood Products is a Colorado family-owned homeowner supply yard that boasts a staff with over a century of combined experience in construction and material supply. Our family of building products come in a variety of materials including natural wood, western red cedar, wood-plastic composite, capped composite, and PVC with a multitude of matching or contrasting designs. Whatever your outdoor project demands, we have the solutions with our high quality building materials. Discover what option is right for you.